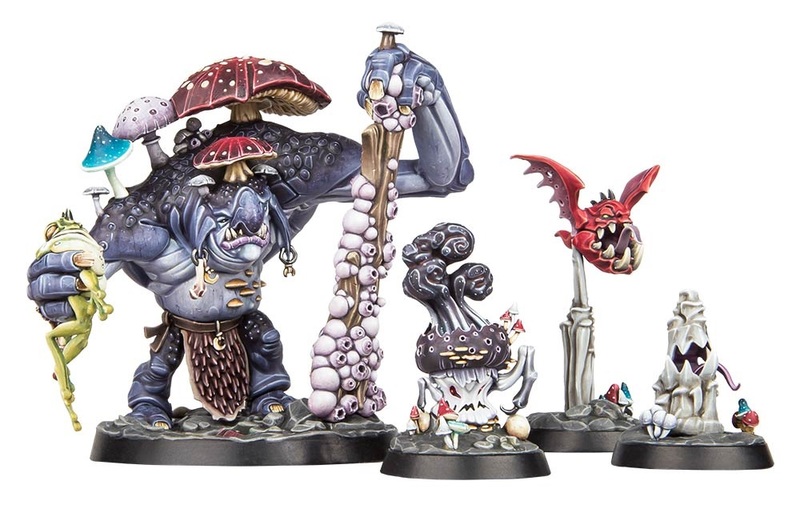 Troggs are the revamped Trolls in Age of Sigmar and we’ve seen a bunch of cool stuff from them thanks to the Gloomspite Gitz. But now GW is finally talking about Mollog’s Mob which is heading into the battle arenas of Warhammer Underworlds. We’ve seen teasers before – but today we get to take a closer look at ALL their rules. 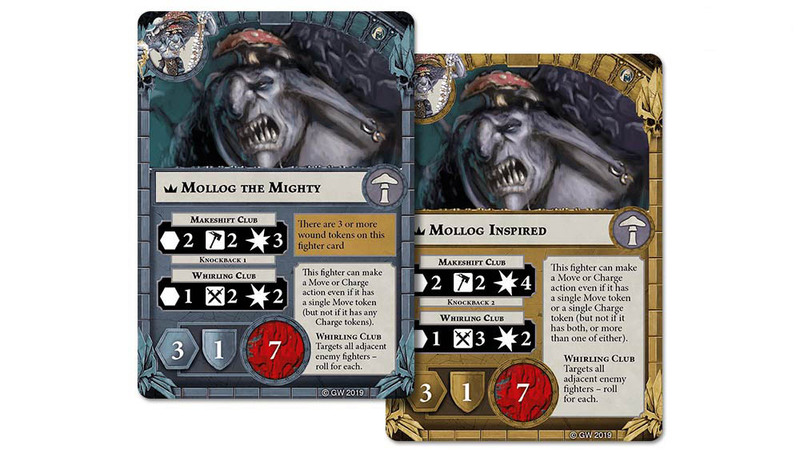 Mollog’s Mob turns Warhammer Underworlds on its head – not so much a warband as a single, super-powerful fighter and his support team. Brutally effective in aggressive play, you’ll find Mollog’s mob fun, fast and completely unlike any other warband you’ve played before. Let’s take a look at the fighters. First up is the leader and all around all-star for the Warband – Mollog the Mighty! This Trogg hits HARD. Not only does his Whirling Club deal two damage, it also hits all adjacent enemy fighters which punishes you for grouping up. On top of that, this guy is surprisingly mobile as he is able to make a Move or a Charge action even if he already has a Move token. That’s a potential 6 spaces of movement per round. While his armor isn’t particularly great, he does have 7 wounds – which is the most of any model in the game! The rest of the fighters in the warband are really designed to enable Mollog to do what he does best – SMASH. That said, they do have a handful of dirty tricks they can use to help out. 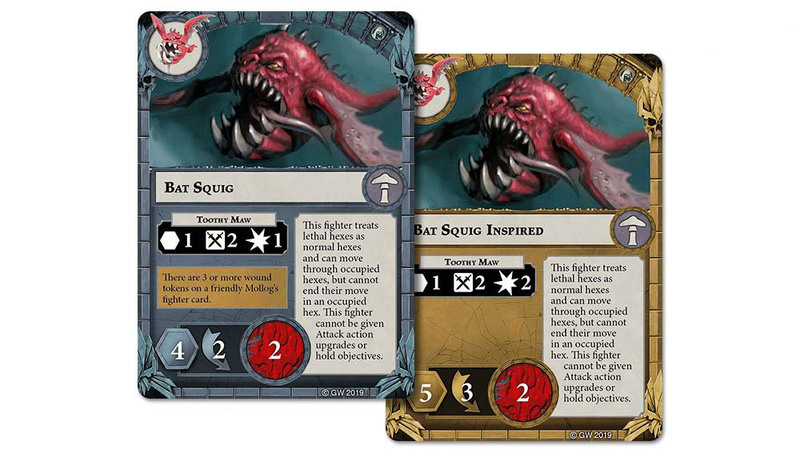 The Bat Squig is not exactly a fighter – but it can go pretty much anywhere. That’s going to be useful for blocking objectives (note: not holding them) and providing some support to Mollog’s die rolls. Stalagsquig is…well, immobile. However, it CAN pop-up on ANY empty hex after deployment but before the first activation. 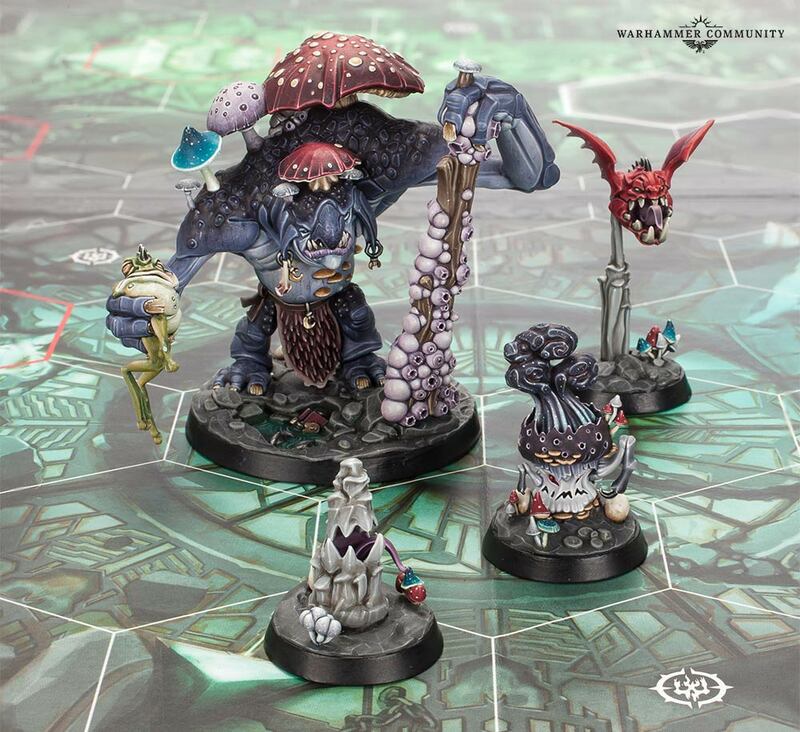 Again, smart deployment will determine how well you use this strange, strange squig. 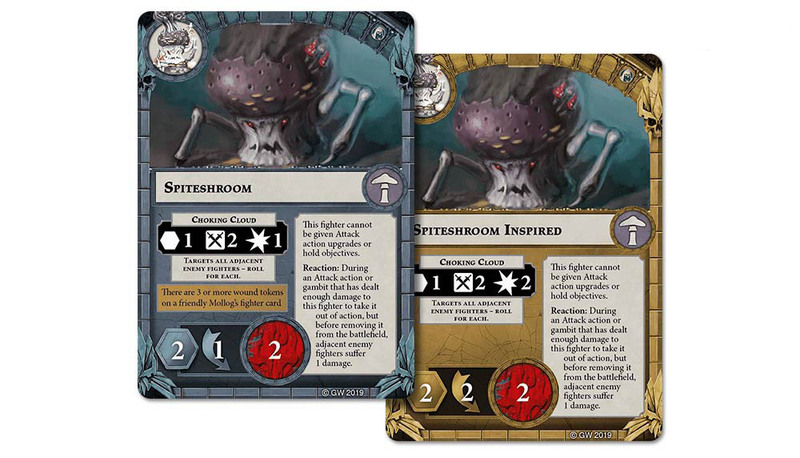 The Spiteshroom is a slow-moving stink cloud that just drops its AoE Choking Cloud around. The attack also targets all adjacent enemy fighters when it triggers. It’s not particularly tough but it can setup some killing blows for the big guy later on down the road. 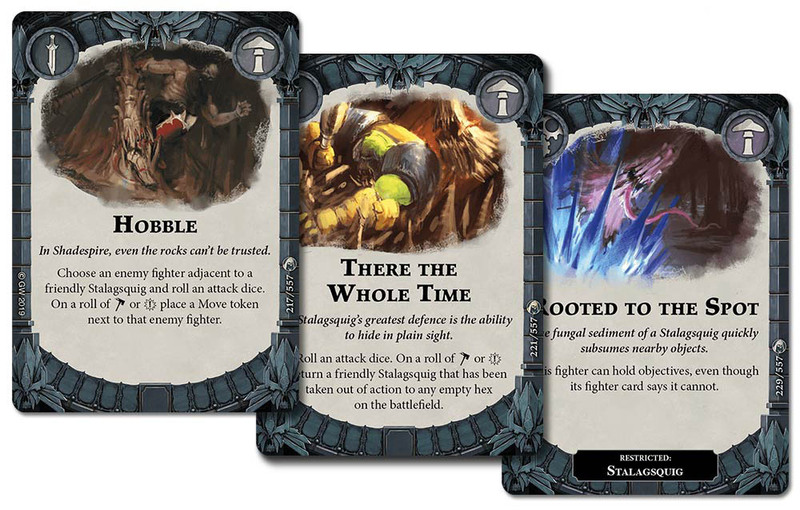 Along with the warband, the set will also include some brand new cards for the crew to use in game. This is where the magic really happens. Shrouded in Gloom provides some “cover” to your warriors. Horrific Stench negates supporting fighters by 1 and Got Them actually rewards you for getting in range of multiple baddies at once. Hobble will ensnare an enemy model for a round by forcing them to have a Move token. There the Whole Time brings a Stalagsquig BACK into the fight. 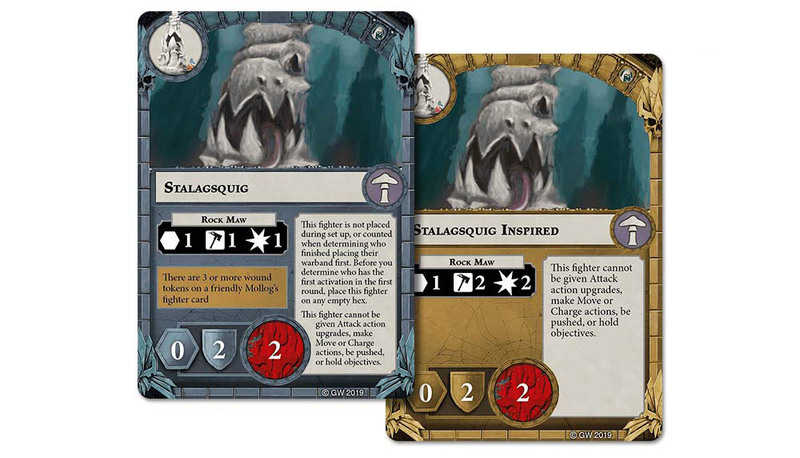 Finally, Rooted to the Spot allows the Stalagsquig to hold objectives – which overrides the card text! 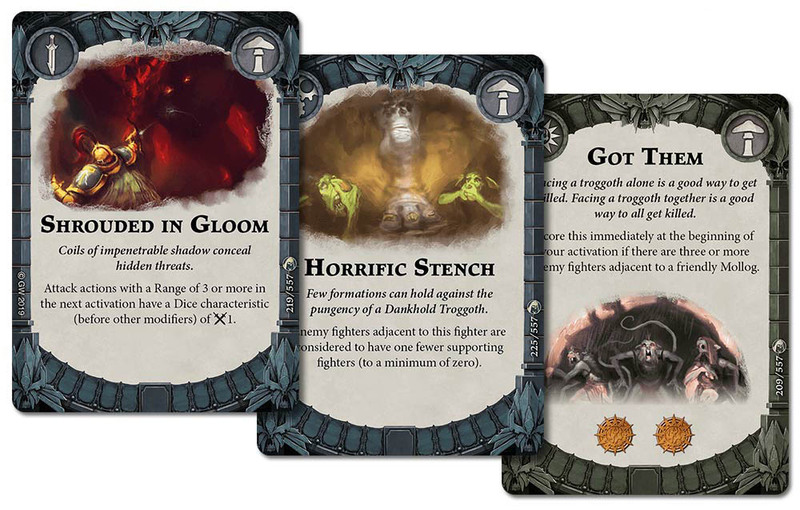 You can see how these cards would work together – have your Stalagsquig deny a move (and probably get killed) with Hobble, then use There the Whole Time to pop back on the board and use Rooted to the Spot to claim an objective. Sneaky-sneaky! While this Warband does bring quite the punch, it’s really only got the one heavy-hitter. However, with smart positioning and planning you can actually support Mollog with the other fighters in your warband. Keep your opponents off balance with aggressive play and then counter with some surprise tactics in the late game to snag victory with the jaws of a Stalagsquig. This is just the tip of the iceberg for Mollog’s Mob! What do you think of this unique Warband? Are you up to the challenge of simultaneously playing aggressive with Mollog AND keeping him protected?